This time last year, Volunteers of America entered into a period of widespread disaster response unprecedented in our organization’s history. Not one but three powerful hurricanes made landfall in areas where we have a significant presence. Hurricane Harvey left much of coastal Texas under several feet of water for up to a week. High winds from Hurricane Irma damaged Volunteers of America properties throughout Florida a week later. The worst devastation followed, however, when Hurricane Maria pushed across Puerto Rico, leaving a path of destruction that left large areas of the island without even the most basic infrastructure. After countess people were left without power, food, water and other basic needs, Volunteers of America established Project Esperanza (Spanish for “Hope”) to help relieve seniors, children and families of their desperation. 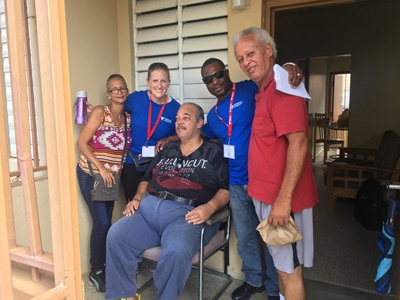 In four weeks, we assessed the needs and attended to more than 3,000 senior households, as well as delivered more than 50,000 pounds of supplies to the island. But despite Project Esperanza’s best efforts, there is still so much work to be done before the people of Puerto Rico are back on their feet. All too often, once a natural disaster drops out of the news cycle, people not affected forget or think the crisis has been resolved. Rarely is that the case. A year later, those devastated by last September’s storms continue to rebuild, not only physical structures but all other aspects of their lives as well. We know from our experience in Louisiana and Mississippi following Katrina that recovery can continue for a decade or more. But recovery requires an ongoing stream of resources, both physical supplies and money, long after most potential donors have moved on. The burden falls on organizations like Volunteers of America to continue working to make sure the needs of those we serve remain on society’s radar. The people of Puerto Rico remain especially in need of help. Please consider supporting our work there.